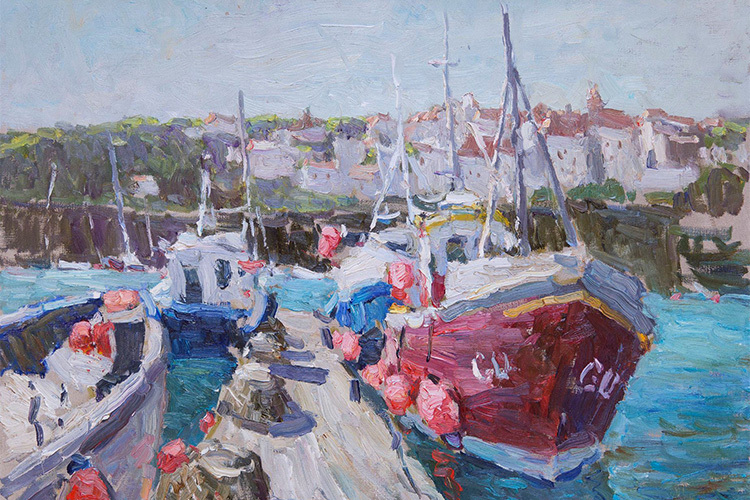 Art for Guernsey’s 2018 Artist in Residence was renowned Russian oil painter Dimitri Permiakov. 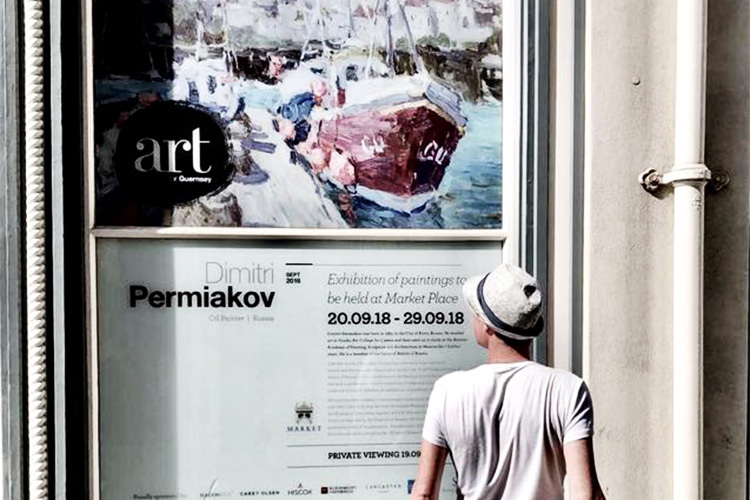 Dimitri hails from the city of Kirov in western Russia, almost 1000 kilomteters east of Moscow (such is the vastness of his country), and visited Guernsey twice during his residency this year; once in May and then again in September when an exhibition of his works were shown at the Guernsey Market Buildings. 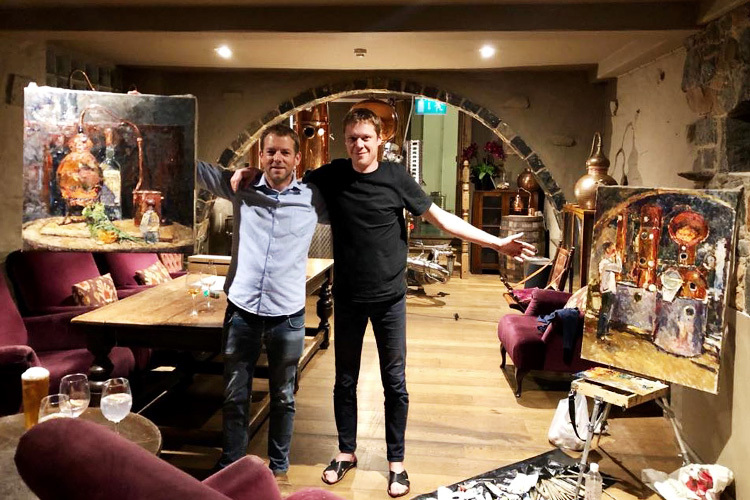 During his most recent visit, Dimitri also joined us at the Bella Luce Hotel to paint our stills and distill his very own expression of Wheadon’s Gin. Dimitri Permiakov has been a professional artist for a decade, having studied at Vyatka Art College for five years and then the Russian Academy of Painting, Sculpture and Architecture in Moscow for a further seven years. He is one of Russia’s leading current artists and his paintings have been exhibited in Moscow and St Petersburg, in the State Hermitage Museum, the Museum of Fine Arts, the Museum of Decorative, Applied and Folk Arts, and the Central House of Artists. His exhibition with Art for Guernsey was his first not only in the UK, but also in Western Europe. Dimitri is best known for his depictions of life in the rural north of Russia, often venturing out to paint “en plein air” in the snow, forests and mountains. His depictions of fishermen in the north and their tough daily existence are particularly striking, and are an example of Dimitri’s desire to record this fast-disappearing way of life. He works in the tradition of Russian realistic painting, inspired by the 20th Century Soviet period and the French Impressionists. Being so familiar with Renoir’s impressionist renderings of our local beach at Moulin Huet, it was exciting for us to see Dimitri working with oils in a similar (to the untrained eye) style. He is a dynamic and “temperamental” artist, dabbing and smearing his canvases, working towards the complete vision he has for the piece. 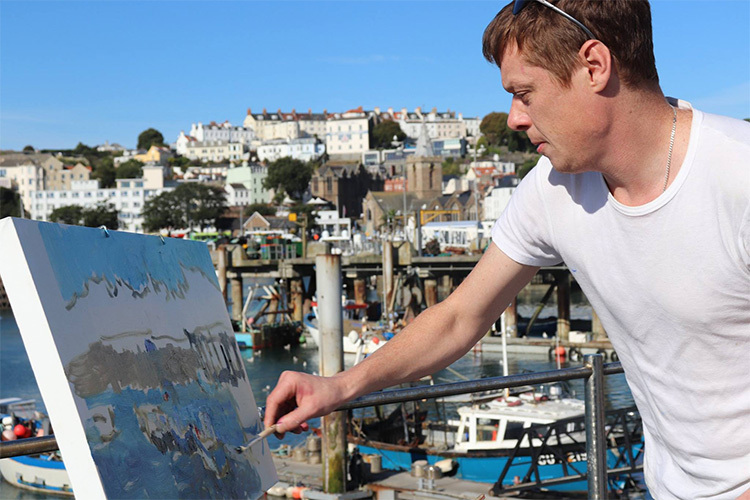 During his visits to Guernsey Dimitri painted on an almost daily basis, creating both large canvases for his exhibition and also visiting schools to lead workshops. As a former art student, it was important to Dimitri to work with students in Guernsey and hopefully to inspire some of them to pursue art as a career. Each of the works that he painted with Guernsey’s schools were left with them as a gift. During his visit to the Wheadon’s Gin distillery at the Bella Luce, Dimitri created two canvases; one of Master Distiller Luke Wheadon in front of “Old Nick”, our beautiful and enormous copper still named after his father that dominates the back of the Bella Luce’s cellar, and another “still life” style canvas of a small copper alembic still and some of our signature botanicals. 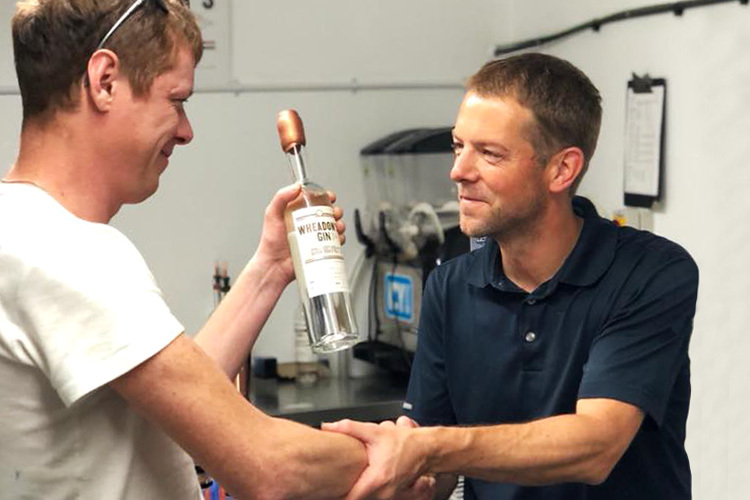 Luke and Dimitri then distilled a very special single small batch “Permiakov Blend” using one of our small alembic stills, for him to take away as a memento of his visit. It was a pleasure welcoming Dimitri to the home of Wheadon’s Gin and spending some time with him. We are grateful to David Ummels of Art for Guernsey, for his hard work every year bringing such world-class artists to our island for such a valuable cultural exchange, and to inspire our island’s young people.